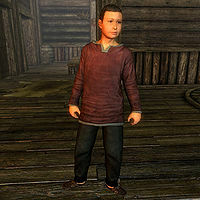 Samuel, an Imperial child, is one of the children living in Honorhall Orphanage in Riften. His mother used to work at the orphanage before she died when he was born. Although he has never met his parents, he hopes they will eventually come back for him. He is a friend of Aventus Aretino and will be overjoyed if you kill Grelod the Kind. If Hearthfire is installed, it is possible to adopt him after Grelod's death. Samuel then returns to his normal schedule: he sleeps from 10pm to 6am, waking up to wander around the orphanage. At 10am, he plays with his friends in the yard for one hour before he returns inside. He has a one-hour meal at 3pm. When you pass by him, he will wonder, "Why's someone like you want to hang around a place like this?" If Grelod still lives, he will also tell you, "Come to get yourself a kid? You're out of luck. No way Grelod will let any of us get adopted. Especially not since Aventus took off." or "Grelod ain't going to like some stranger just hangin' around. Not that I care." If Grelod is alive, he can be asked to tell you more about her: "Sometimes, when she goes to her room to work or sleep, I slip out for a bit. Noontime, every day - that's when I hit the streets. A boy's gotta make a livin', right?" You can also ask him about Aventus, if you have not spoken to Aventus himself. He will respond, "Aventus Aretino. He was sent to live here after his mother died. He escaped. And... Before he left, he said he was going to do the Black Sacrament. You know, to call the Dark Brotherhood. So they'd come and kill old Grelod!" If Grelod is alive, he will end by saying, "Word out on the street is that he went home to Windhelm, and people have heard strange chanting coming from his house. He's really doing it!" Otherwise he will tell you, "Word out on the street is that he went home to Windhelm, and people have heard strange chanting coming from his house. Looks like he really did it!" Grelod will often complain to Constance Michel about him, saying, "Samuel is getting to be a problem. Fancies himself something of a 'leader' to the other children. Put an end to the nonsense, or I will." or "I can't abide Samuel's constant talk of his parents. 'They're coming for me.' 'This is only temporary.' The boy must accept his fate." Constance will claim to have the problem handled soon. He and his friends will be delighted to see Grelod dead. Samuel will cheer, "Ha ha ha ha ha! Hooray!" or "Hooray! Grelod the Kind is dead at last! We're saved!" He may also ask you, "Did you see that?" Before you return to Aventus, he may comment, "When Aventus took off, when he said those things, about killing Grelod... I never imagined he was serious..."
Now that Grelod is dead and Constance is alive to take over, Samuel will remark on the change: "Constance don't care much for strangers in the orphanage. Afraid someone might hurt one of us kids. Which, I gotta admit, is kind of nice." If you wish to adopt him, ask him to introduce himself first. He will reply, "Name's Samuel. Never met my parents. Grelod said my mother worked here at the Orphanage, but she died when I was born. Constance and the others are nice enough, but I... I want to have a real family." You can then adopt him. When you ask Samuel to tell you about Grelod, he will skip to the next dialogue after he says, "slip out for a bit". After you agree to adopt him, Samuel may never leave the orphanage, instead saying that he needs to collect his things and say goodbye each time you try to talk to him. To fix this, stand inside your house and use the console command prid 19de7 to select him, followed by moveto player to move him to your location. This page was last modified on 15 September 2014, at 22:48.